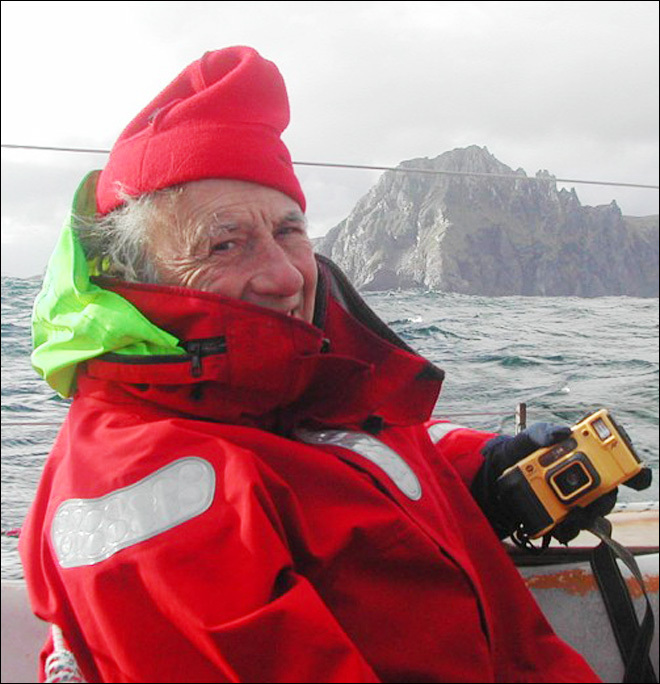 It began in February 2005 when Berrimilla was down in the Southern Ocean about halfway between New Zealand and Cape Horn [link]. I was on watch in the cockpit one night, idly musing that we were probably as far as it is possible to get from any other human being on the planet. Then I remembered the International Space Station, orbiting several times a day somewhere overhead – its crew the nearest human beings to Berrimilla as they passed about 300km above us, travelling at 5 miles a second, rather faster that Berrimilla’s plodding 5 knots. It seemed to me that the ISS crew were, in many ways, in similar circumstances to ourselves and I thought it would be interesting to talk to them. I emailed our web-minder Malcolm Robinson in Hobart, and he sent us the ISS overpass schedule and also emailed NASA, who replied with unusually blistering speed about a month later. 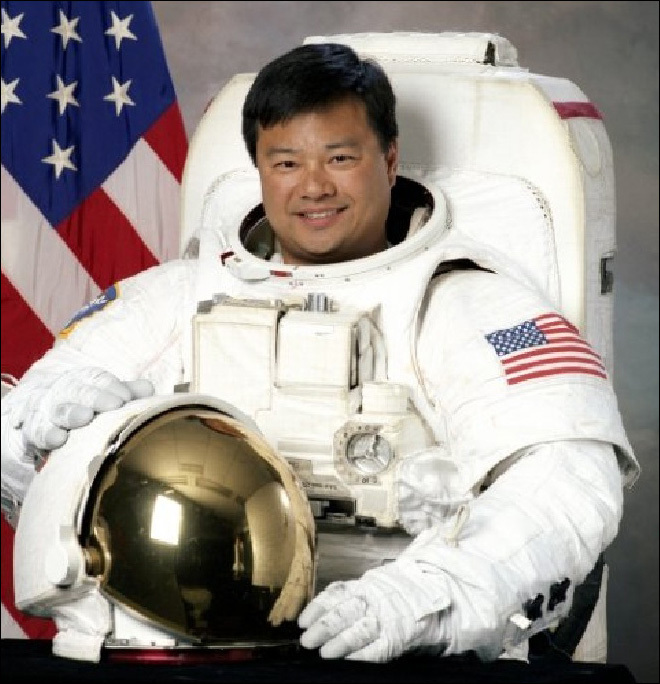 Up in the ISS, when the message eventually reached him, the Expedition 10 Commander Leroy Chiao could see the similarities and agreed to talk to us. Thanks, Leroy! It took some time for NASA to arrange the contact and Berrimilla was close to Cape Horn before it could be fitted into the ISS schedule. We agreed to speak by phone from the Falkland Islands, which happened a week or so later. I have a recording of the conversation, in which we arranged to try to stay in touch and do some trivial science as we sailed up the Atlantic. After the call we were able to send Leroy some video of conditions on board, just to make him feel good in his warm, dry, airconditioned collection of exotic metal cans. What followed was, for Pete and me, a fascinating series of contacts with Leroy by satellite phone, during which we tried on several occasions to make ourselves visible to the ISS using white flares and parachute rockets and shining our searchlight skywards in the general direction of their overpass. We also talked to him once from underneath a huge and frighteningly destructive electrical storm which he could see clearly from space. 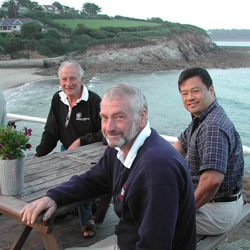 The ISS crew returned to Kazakhstan in April 2005 while Berrimilla plodded on up the Atlantic, reaching Falmouth on 3 June. Leroy and his wife Karen were in Scotland at the time, and they came down to visit us and do some intensive research into the merits of Cornish beer. We have been close friends ever since. Leroy retired from NASA in 2006 and, in his new life as a Distinguished Professor at Louisiana State University (LSU), he invited us to take part in a Symposium on Risk and Exploration, using our voyage as a simple analogue for a journey into deep space. At the symposium, Dr. Pascal Lee who runs the Houghton Mars Project camp on Devon Island in the Canadian Arctic, draw a map in my notebook and signed it. 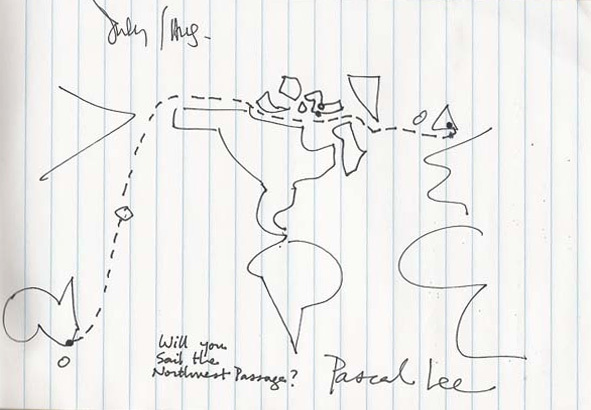 Pascal’s map, drawn on the bar in the LSU campus pub. This became the chart for Berrimilla 2nd circumnavigation. It was just over the halfway point of my space station mission – at about the four-month mark, when I received a note from the NASA public affairs office. 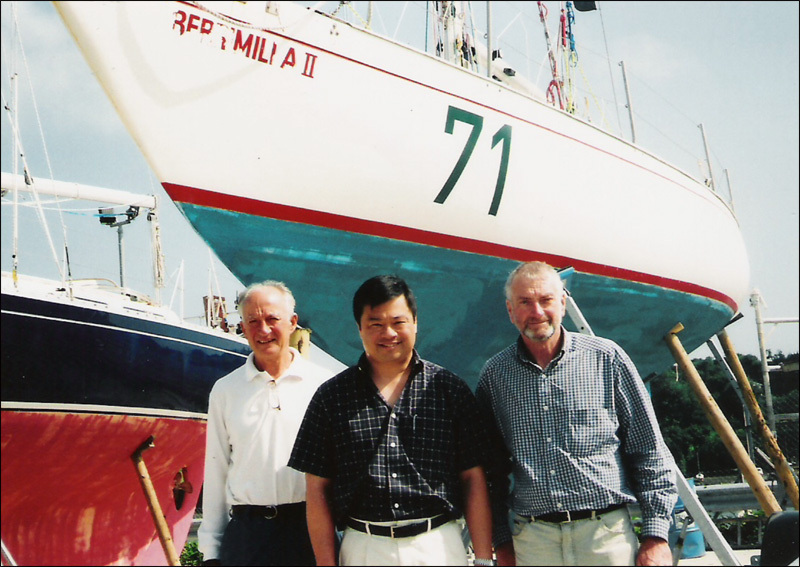 It seemed that there were these two men from Australia who were sailing a small ship all over the world and they wanted to talk to perhaps the only other crew, who at the time, could relate to their feeling of isolation. Of course I was impressed by what they were doing. Braving all the fierce weather that Mother Nature could offer, Alex and Pete were about to sail around Cape Horn in a sturdy little 10-meter boat called Berimilla, or Berry for short. But, I was almost as impressed by Alex’s perseverance in keeping at the big bureaucratic beast called NASA to the point where the message was actually relayed to me, the Commander of Expedition 10, aboard the International Space Station (ISS). 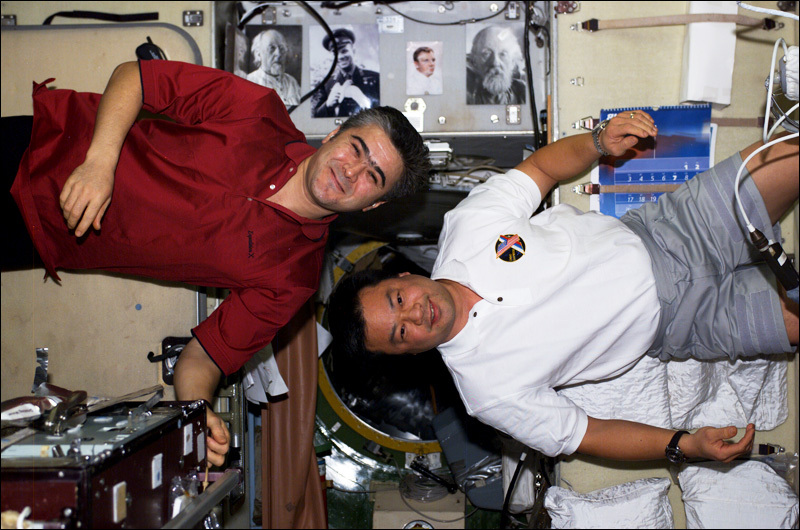 With my crewmate Salizhan Sharipov, a Colonel in the Russian Air Force, I was flying a six-and-a-half month mission in space. We certainly faced danger, especially during the launch phase on top of a Russian Soyuz rocket. However, our lives were quite comfortable aboard the ISS, compared to with what the crew of Berry was making do. The call was arranged. Salizhan and I greeted our intrepid comrades of the sea while they were in port in the Falklands. We traded a few stories and described the conditions of our respective crafts. We were most jealous of their stash of Pete’s homebrewed stout. 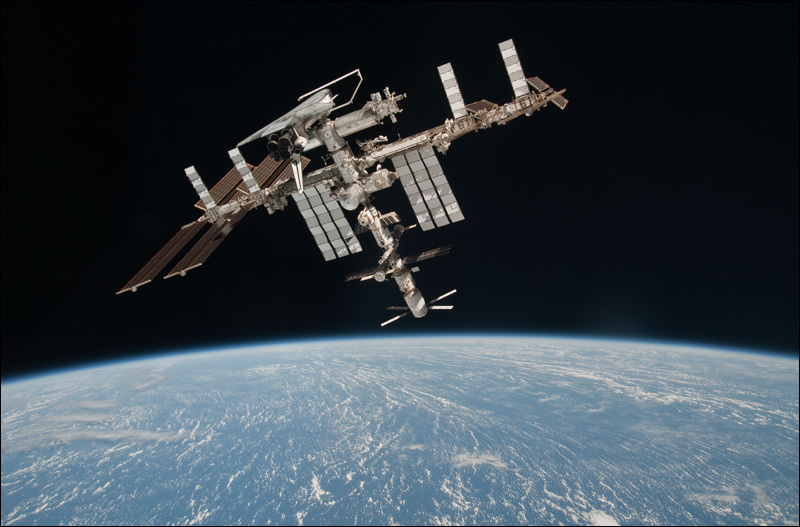 The ISS has Internet protocol phone capability, so the crew can make short phone when the Ku-band antenna is pointing at the satellite. Alex left me the number of their satellite phone and I promised to catch up with them periodically. 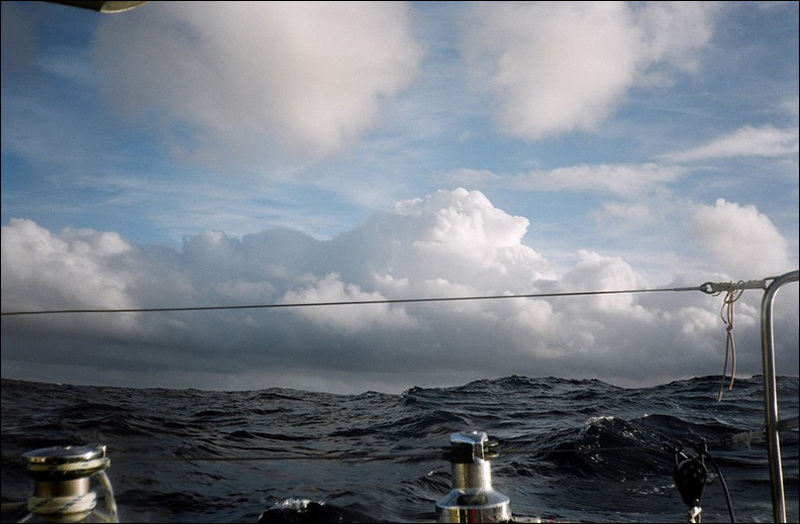 Over the next two and a half months, I spoke with the crew of Berimilla and tracked their progress as they headed up the coast of Argentina, on their way to England. On a couple of clear nights, we coordinated our timing and I tried to spot rocket flares that Berry’s crew fired. Unfortunately, I never spotted any. Alex and I agreed that they would not fire any more, lest they run short when they really needed them! After my return from space, my wife Karen and I made our way to the UK. There, we coordinated a visit with Alex and Pete in Portsmouth. Upon our arrival, Alex’s first suggestion was that we sit down and have a pint of stout. I knew immediately that we were kindred spirits! We spent a lovely weekend with Alex and Pete and promised to get together in the US and in Australia. At the time of this writing, they are off again on yet another sailing adventure with Berimilla. It is their indomitable spirit and thirst for adventure that all explorers admire and understand.